A Lake, a Volcano, and a Colonial City, All in One Day! The northern Costa Rican border is very close to many of the most popular tourist sites in Nicaragua, and this full-day tour is a great opportunity to get a taste of what makes Nicaragua an up-and-coming tourist destination. It’s one of the region’s best kept secrets, as all the wondrous nature—impressive volcanoes, pristine beaches, and wide lakes—is combined with an infusion of colonial architecture and rich history. Start your day early to avoid any down time at the border, and once in Nicaragua enjoy a traditional Nicaraguan breakfast near the small city of Rivas. Then continue to city of Granada, where you’ll be exploring this charming town through mid-afternoon. 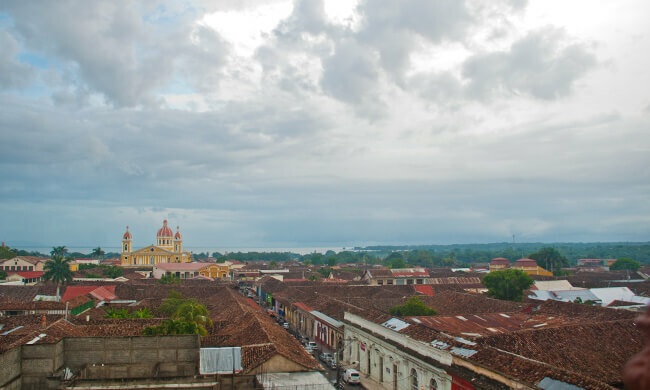 Granada is one of the oldest colonial cities in the Americas, settled by the Spanish in 1524, and it still holds colorful colonial-era architectural influences today. Tour the main city sites on a horse-drawn carriage, just as they did over 200 years ago! Unlike anything that you can see in Costa Rica, Granada is a true colonial gem of Central America. You’ll want to return again, much like the numerous expats that have made this town their home. Enjoy lunch with a view from the amazing Laguna Apoyo lookout point, from where you’ll see Lake Nicaragua, the world’s 19th largest lake. Then head out to visit the active Masaya volcano to have a glimpse at lava in its crater, bats, and incredible views. Your last stop is at the Masaya Artisan Market, the most famous in the country. No trip to Nicaragua is complete without a visit! Be sure to check our the handmade shoes, as Nicaraguan shoemakers are famous throughout the isthmus. This tour is ideal for anyone who wants to enjoy both history and nature. Your guide will be a wealth of information about the history and culture of the region, and you’ll experience just a bit of what Nicaragua has to offer in just a day. Plus, you’ll get another stamp in your passport! Tour includes: Transportation, bilingual guide, breakfast, lunch, drinks, entrance into the park, insurance. What to bring: Passport, hat, camera, sunscreen, insect repellent, extra cash for souvenirs and border fee. Wear comfortable clothes!